ING1 is a tumour suppressor. Affinity purified rabbit polyclonal anti-p33 ING1 is developed with the N-terminal peptide based on mouse p33 ING1, identical in sequence to human p33 ING1. This product is prepared by linking the affinity purified anti-ING1 antibody to HRP via reductive amination. Western blot analysis of p33 ING1 in melanoma cells. 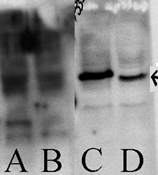 A: Cell expressed flag-tag p33 ING1, blot with antibody from other commercial source. B: Cell expressed p33 ING1, blot with antibody from other commercial source. C: Cell expressed flag-tag p33 ING1, blot with ICP0283. D: Cell expressed p33 ING1, blot with ICP0283. Recognizes p33 ING1 of human and mouse; does not cross react with other members of the ING family.